After the game update on Sept. 27th, there has been an issue with completing the Message in a Bottle quest. You receive the quest in Flotsom and discover that the Captain was shrunk with his ship and placed in a bottle with it. Egads! Your mission is to save the captain from the bottle. 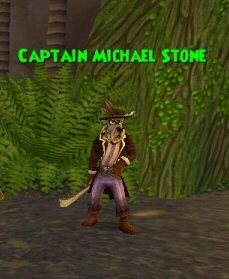 Once you have completed all the required elements, you are sent to the Watermole Village on Skull Island to talk to the captain. You might see him at first, but when you approach him, he disappears. Or you can approach him and talk to him for the first section of his conversation. He thanks you and says he has a treasure for you in return. After he finishes those first words he disappears before he can give you the treasure and complete the quest. I gave this option a whirl and it worked perfectly! Yeah!!! Sneaky Victoria leveled up to a 12th Ranked pirate and I was on my merry little way to the next quest. Go to the top of the screen to access the game menu. Select the “Bolt” icon at the end of the menu. Then select the Options label in the pop up window. Select the 2nd to the last icon, the one that looks like Earth. The Realm you are in will appear above the list on the left side of the pop-up window. 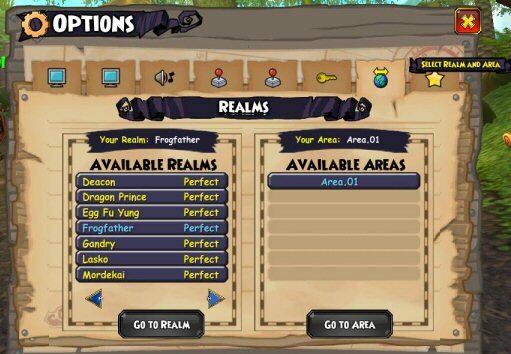 To change to a different world, select the one that appeals to you and then click the “Go To Realm” button at the bottom of the list. Go back to the game and you should see the Captain to complete the quest. Thanks to everyone on the board for the work around!